Tag Archive | "Erpetoichthys calabaricus"
Ropefish (Erpetoichthys calabaricus) also called the Reedfish or Snakefish, is a primitive member of the Bichir family that is native to West and Middle Africa. Its natural habitat stretches from the Ogun River in Nigeria to the Chiloango River in the Republic of the Congo. The Ropefish lives in warm, slow moving or standing, brackish or fresh water and can breathe atmospheric air when necessary to survive low dissolved oxygen water conditions. They have a pair of “lungs” which allows them to live quite some time out of water. Ropefish have several unusual features that include an elongated eel like body, a flattened head, thick bony scales that create a reticulated pattern, and a modified swim bladder that acts as a pair of lungs. The Ropefish grows to 15 inches in length, has poor eyesight, and is a nocturnal predator. In its natural habitat, it feeds on worms, crustaceans and insects. These fascinating fish are have an inquisitive personality and are favorites of many tropical fish keeping enthusiasts. Despite their large size, they are quite peaceful by nature and are usually the target of “bullying” in an aquarium. 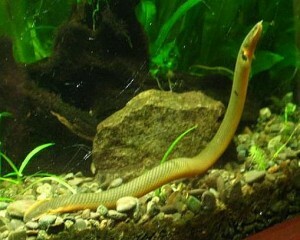 They are quite social and enjoy the company of other Ropefish, especially when in an aquarium environment. Ropefish will occasionally jump out of the aquarium when bullied by other fish, so a tight cover is recommended when keeping this species. They are notorious “escape artists” and can “jump” quite a distance. They need a large densely planted, sand or fine gravel tank, with plenty of roots and driftwood for them to hide in. They are benefited by the addition of a small amount of salt to their tank. Although Ropefish are nocturnal, they can be encouraged to come out during the day by feeding them bloodworms, redworms, or nightcrawlers. When placed in with more aggressive fish, they have a tendency to stay close to the surface of the tank where they feel safer. These fish frequently leave the water when they feel threatened or when water quality mandates them to do so. 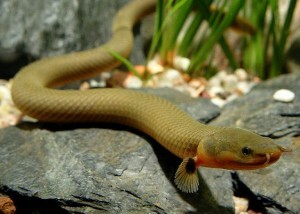 The Rope Fish is a carnivore and requires live food in its diet. earthworms , bloodworms , tubifex, insect larvae , and chopped meat or beef heart will all be readily accepted. No breeding of Ropefish has ever been documented in an aquarium setting. When available for purchase, Ropefish are usually less than 10″ in length.